Downtown Gallery Carpark Cycling Race 2018 | JustRunLah! 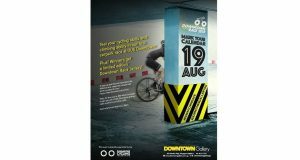 Dust off your bikes and hit the ground pedaling at Downtown Race 2018 as it comes to Downtown Gallery – taking place in the carpark for the very first time! Singapore’s top cyclists from the road, mountain and fixed gear categories will take over the carpark for an exciting morning of competition. If you feel up for putting your cycling skills and climbing ability to the test, we’d like to invite you and your favourite cycling buddy to join in the exciting race. Taking on the format of a two-up time trial, the race will have a pair of riders face off each other at once in the “Race a Mate” qualifiers. Suitable for people of all ages and fitness, the Downtown Race 2018 promises a competitive and adrenaline-pumping Sunday for cycling enthusiasts. The Women’s and Men’s open categories will see the top 10 finalists battle out for a spot of King or Queen of the Downtown Race 2018. Families can also get in on the fun with kids-friendly activities and cycling-related talks by passionate advocates of the sport. For Women’s Sport and Juniors, riders below the minimum age is accepted if parental consent is provided. *All riders below 17 years of age are required to complete a parental consent form that can be submitted on the day of event.